"All we want is to be a part of a loving family"
We will follow up with you when it is received. Do you know someone who would like some companionship and lives in a quiet household who could open their heart to a cat who just wants to be treated with a little kindness? Do you have experience with timid cats and enjoy the rewarding experience which comes from fostering a rescue cat, giving them love and attention and seeing them come out of their shell and snuggle up with you for cuddles and pats? We are urgently seeking new foster carers to join us, both short term and ongoing, for a number of gorgeous cats, some of whom are naturally outgoing and a few who are shy and just need a little extra kindness and patience. Our grateful thanks to Royal Canin for their generous ongoing support with dog and cat food. "can you offer us a place in your home ? We would love to join your family !" 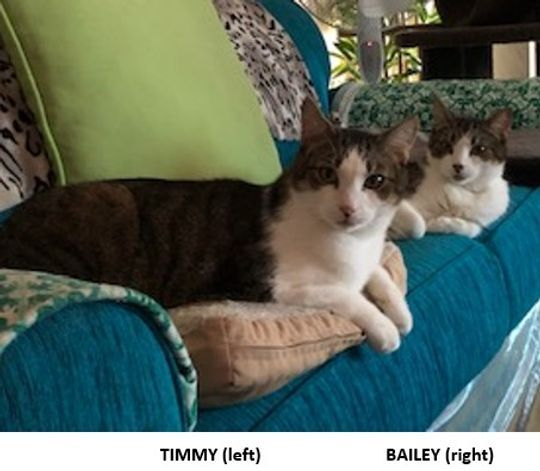 Timmy and Bailey are very smoochy brothers who are looking for a home together as they are closely bonded. Timmy is slightly more shy than Bailey and would suit a family without noisy children. 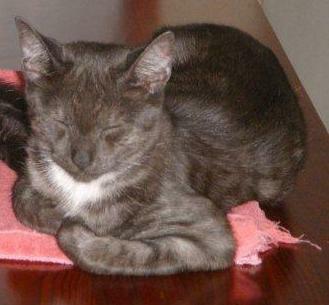 Bailey - short haired handsome tabby with classic tabby circles, has a black nose. Very smoochy boy and is very adventurous. Timmy - short haired tabby with Tiger stripes. Looks like Bailey's twin but has a white nose. Smoochy boy once he knows you.Timmy loves his food. We are looking for a new foster carer - Can you foster us ? we are very friendly loving sisters and would love to share your home till we find our furever family. Full sponsorship $40 per cat per month. Half sponsorship $20 per month. 23/3/13 Niki and Miki and their sisters Bonnie & Maddy were at the pound without their mum when we rescued them..
Niki and Miki are inseparable, loving sisters. Like Thelma and Louise, they are different, yet complement each other so well. We would love to see them adopted together as they adore and take good care of each other. What do they have in common? Both are super affectionate, gentle cats. Both dislike being grabbed or lifted off the ground; they prefer to come to you and sit next to you and get lots of petting. Occasionally they will sit on your lap, which is a very special treat. They enjoy sleeping on the bed with foster mom - sometimes by her feet, or right next to her. They are very gentle and never scratch people, not even when jumping on their lap. Both are very clean, and use the litter box with perfection with no accidents.. . No loud meows; they make a cute trrr sound instead. When a new kitten was brought into the home, at first they hissed at him and kept their distance; but after 2 days they became "moms". They've come to adore him, and are always giving him baths and playing with him. Niki (Nikita )orange tabby with white tummy, face and legs has a slimmer face and black "eyeliner" on her left eye with a black spot on her left nostril. She is the most extroverted of the two, being the first to have come out and explore her foster mom's house, and happily greeting the occasional visitor. When she wants something, she'll let you know. She has a funny way of staring right into your eyes, as if trying to tell you something. When she wants to be petted (which is very often!) she'll look all cute and rub against the computer screen or a wall corner, as a way of asking. She loooves eating, and is always last to leave the food bowl. Miki (short for Mikaela) has a rounder, whiter face. She is the shy one of the duo, hid under the bed and cried for a day when first brought to her new foster mom's home. She likes having her own space; she loves climbing to the highest spot of the house (nowhere her sister dares to go!) and spending hours thinking about... whatever cats think about. She loves getting petted, and her favorite is a belly rub; she'll lie on her back and streeetch out, to let you know that she wants one of those. Other times, when she wants some affection, she doesn't come to you asking for it: she expects you to read her mind and go to her, when she'll go "trrrr" happily. She's the one who sleeps the closest to mom in bed, and the first to stick her little head at the front door's gap when mom is coming home at the end of the day. Somehow a three month foster stint of Niki and Miki turned into eight and it would be more if a new job had not meant I need to travel regularly and at short notice. So it’s with great sadness that I have to say goodbye to Niki and Miki and I hope someone reading this is a position of offer them a home, if not forever then for a few months? 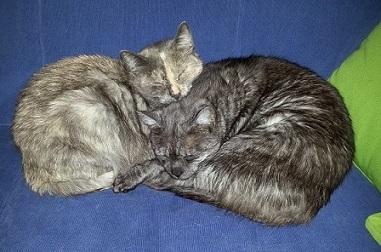 They are great cats, sisters and very close but with quite distinct personalities. Niki loves food (both hers and Mikis if you let her) and hence is a bit larger. But very affectionate, almost like a dog. She is not keen on being picked up and held but loves being brushed. Miki on the other hand is a lap cat, tolerates being picked up but not at all keen on the brush. They both are well behaved, rarely meow and very good on the toilet front. Importantly they let you sleep in in the morning (provided they had a supper the night before) and may even join you on the bed if that’s what you want. They still enjoy playing, sleeping in shoe boxes (a tighter fit for Niki) and using the scratching post. Miki is a bit more inquisitive and independent and loves looking over the balcony rail and surveying the neighbourhood. There is more but why not find that out for yourself! 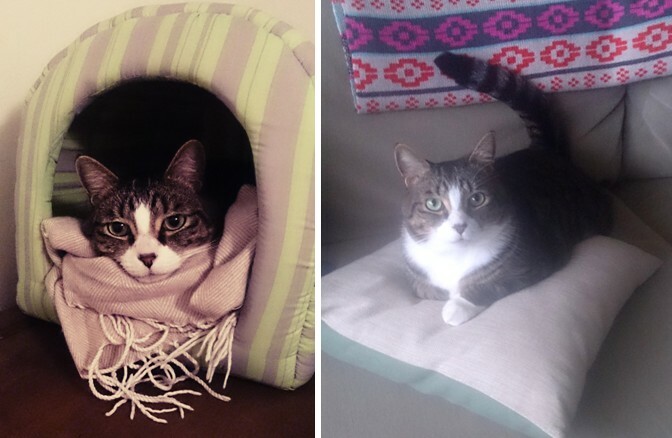 I am offering a well vetted carer who will be fostering for 6 months or longer, or adopter, up to three $100 vouchers for cat stuff (one per month) on the sole provision that photos are somehow made available to me. If I am ever in a position to do a short term caring stint while you are on holiday, I will certainly do so. CAN YOU FOSTER ME ? Hi! I'm looking for a foster carer who is experienced with shy cats. I would love a quiet female household with no young children. I would like to be your only pet so I can get to know you better. 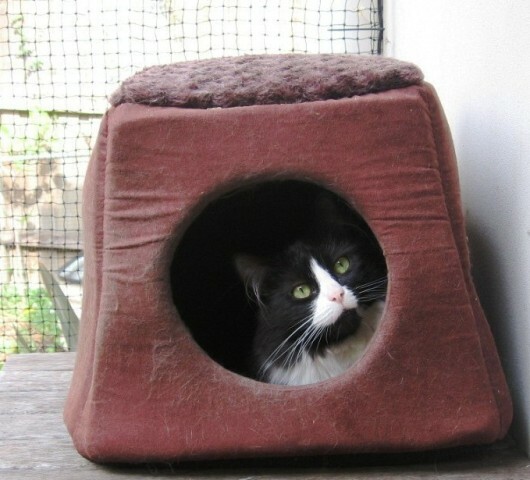 Oct 2013: Possum is a lovely medium-haired black and white cat with a glossy coat and yellow-green eyes. She was rescued from the pound as a kitten. 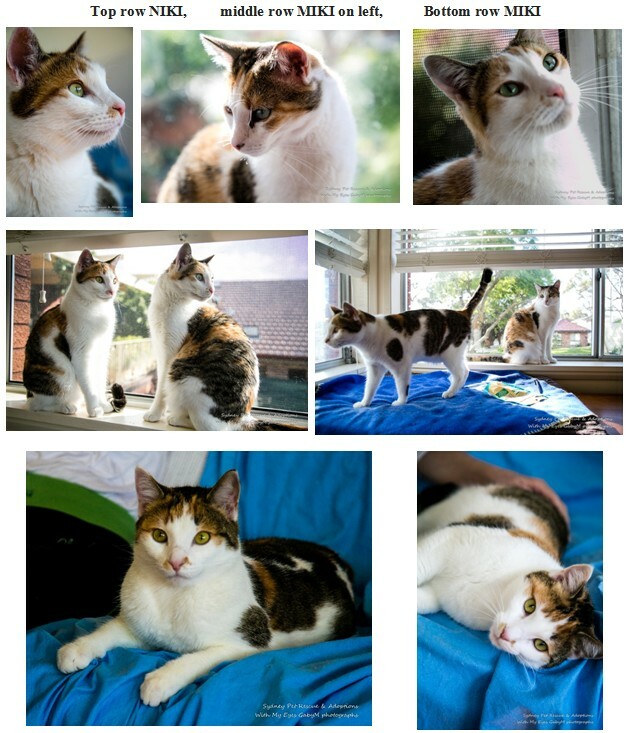 Possum is a timid cat initially and is looking for an experienced single person or couple who will give her time to build trust and confidence. She would benefit from a quiet environment without children or too many other animals. Once settled, she is clever, faithful and loving, lies upside down to have her chin stroked and adores being brushed all over. Possum is bright and likes to play games. 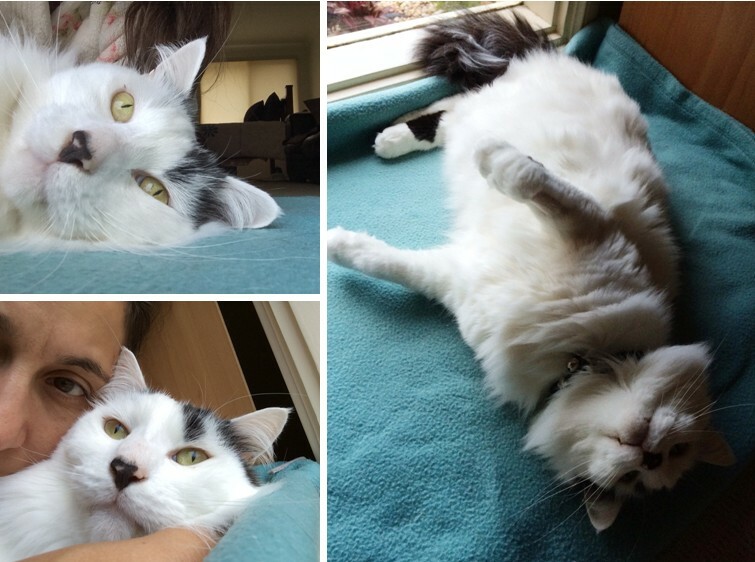 She has a very dear personality with a happy purr. Possum has had access to an outdoor enclosure but indoor living would also suit her well and limited exposure to the sun will protect her pink nose from skin cancer. 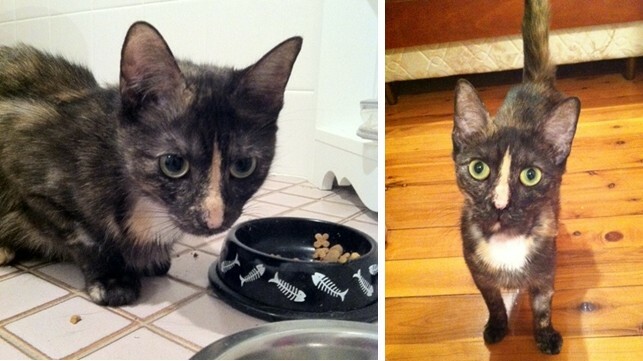 Possum has blossomed so much and is now looking for a gentle and loving home. Currently she has only a small area to herself but her top priority is to have the run of an entire house/apartment where she can share your life and learn to live as part of the family. TC (Top Cat) steel grey tabby with a white bib, was rescued with his brother ChooChoo at 2wks old with their mum Izzy They had to be hand reared as Izzy was too sick to care for them. Izzy is now healthy and ready for her new home, she is listed separately. TC was at first reserved and missing his brother terribly, but then bonded in foster care with Missy, a beautiful brown 10 month old female tabby kitten. She was as fearless as he was shy. 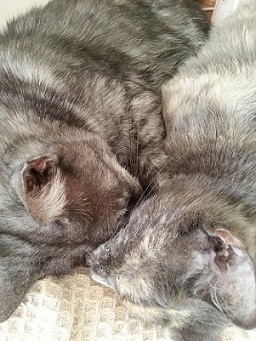 She "brought him out of his shell" and they played, chased and wrestled together frequently; and, occasionally snuggled together in a bedtime embrace. 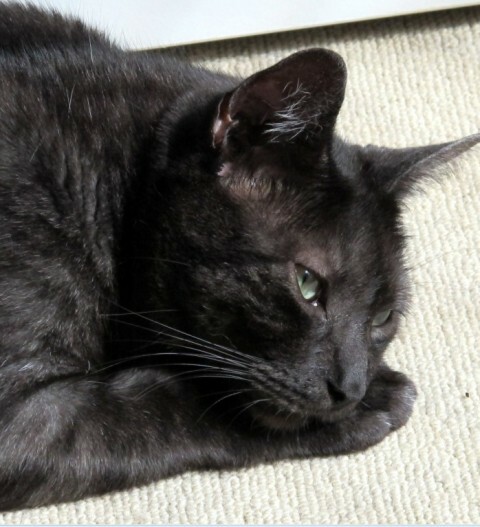 TC is looking for a new foster home or permanent home, perhaps with with his mum Izzy or another cat as a playmate. TC is desexed, vaccinated and microchipped and has tested negative for FIV. He would make an ideal indoor companion for your family. 20/1/12 Izzy is a tiny little short-haired dark tortoiseshell with big green eyes and a fiery orange stripe down her nose. She is a delicate and softly spoken little thing who enjoys being with people. While she can be a little timid with new people she quickly warms up to everyone and loves a good pat, cuddle and ear scratch. Izzy has had a bit of a rough start to life. She was rescued with 5 kittens who had to be hand raised as Izzy needed an operation for a blocked intestine to save her life. It was touch and go for a while, but she’s a tough little thing and has come through it well. When she came to me she was very skinny and underweight. Fortunately she loves her food and she's improved greatly in just a few weeks, although she appears to be naturally small and slender. Izzy has an adorable little miaow that sometimes is barely audible. 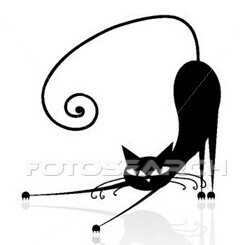 When it can be heard, her miaow sounds more like a squeak, which had led to the nickname ‘Pipsqueak’. Izzy has been very content to live inside and enjoys sitting up high and watching people. She can also keep herself amused and is happy to spend the day by herself whilst I'm at work. Like all youngsters Izzy loves to have a play and chase, but her favourite thing to play with is long shoelaces. She was initially cautious with my two other cats and has gotten used to their presence over a few weeks and now isn't fazed by them at all. Izzy would make a great companion and would fit easily into any household. She has had a rough start in life and appreciates the simple pleasures of a comfy bed, a bowl of food and a warm lap to snuggle on. Can you sponsor me ? 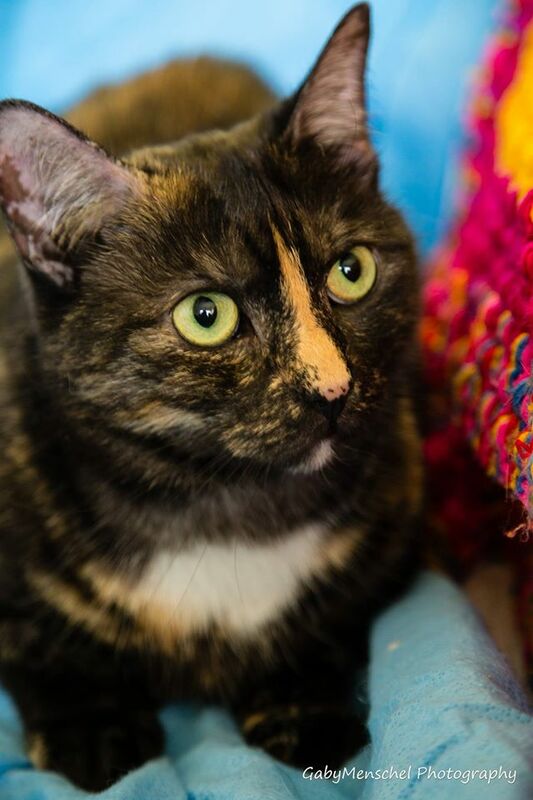 Charlotte is a dainty pale orange tortoiseshell with the cutest stripe down her nose. She is timid at first and will hide until she gets to know you, but then her cheeky affectionate nature will come out and she will soon be demanding to sit on your lap the minute you flop onto the sofa. She loves company and will often follow you room to room, happy just to be near you. She is talkative and has a different meow for every occasion, especially food time. Once she is completely comfortable with you she has a lovely quiet purr that comes out when being petted curled on your lap. She is tireless when playing. Her favourite toy is a piece of string dragged across the floor. she will chase this all around the room and over the furniture. She also often amuses herself by batting a toy about and chasing it down the hallway, skidding on the wooden floor. Any hair ties left on a table will quickly disappear and become Charlotte?s newest toy! Would you like to sponsor me ?? 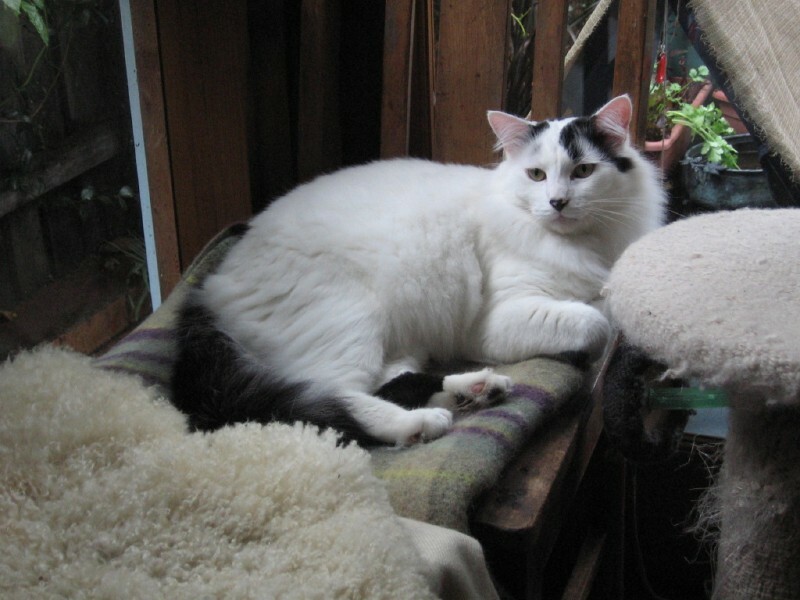 His current carer says - Domino is an incredibly affectionate and placid cat. He adores company and likes to be cuddled and stroked. He has a gorgeous soft, long and fluffy coat and appreciates a brush once a week. He has the calmest temperament of any cat that I have met and likes to follow you everywhere you go. At bed time he walks himself to his bedroom and waits anxiously to be tucked in and kissed good night. He is best suited for a family who is happy to pay him attention and in return will be by your side and be a beautiful companion. 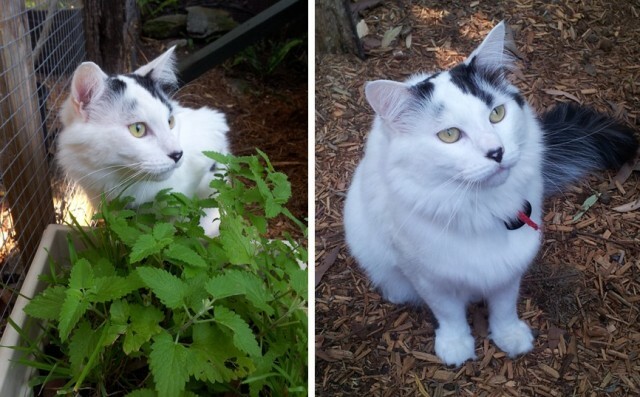 Domino seems to have the traits of a Turkish Van, as you can see from this article http://en.wikipedia.org/wiki/Turkish_Van . 10/11/10 - Clementine has been tested and is FIV negative. August 2012- Update from Meryl - Jasper is very much a boisterous boy. He has an incredibly good nature, They are still quite shy - especially around new people and loud noises, especially the vacuum cleaner. They have a lot of energy and both really enjoy playing - their favorite toy is a dangled shoe lace! They both love a cuddle, and to sit as close as possible to you on the sofa or bed and snuggle up to you. Jasper is a very talkative little boy, and greets you with a constant chatter. Click here to watch a YouTube of Jasper and Jade as kittens. Choo Choo & TC were rescued at 2wks old with their mum Izzy They had to be hand reared with their siblings as Izzy was too sick to care for them. He is not able to toilet independently although he does try. He needs to be manually expressed daily and is getting loving care from Michelle for as long as he needs it. 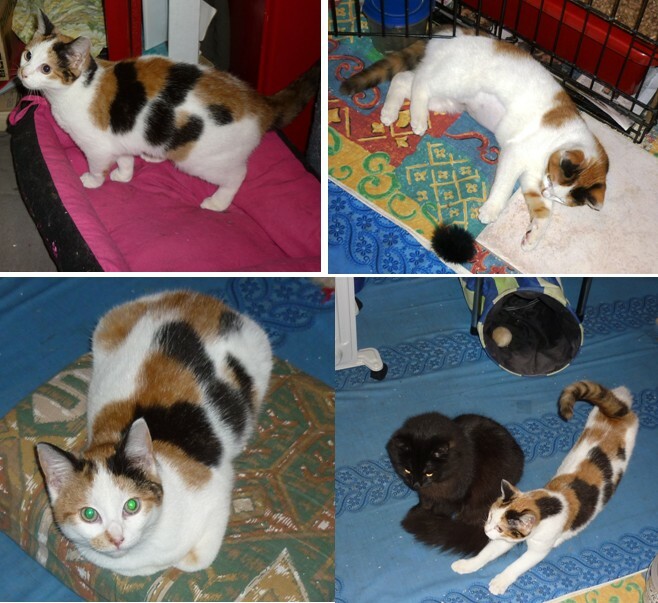 Pixie is a pretty short haired calico torti with an unusual coloured coat.The black markings are only on one side. She is full of life and just loves chasing shoelaces, picking them up and playing tug of war with you, also likes batting table tennis balls back to you especially when she is inside her tunnel or on top of the pen. She hardly meows- she makes little yipping sounds when she sees her food coming and jumps up and down . (she is very food orientated) She loves exploring and has worked out how to use the cat flap. Playing inside the cat tunnel is another big favourite. She dashes around when let out of her room. She is shy with strangers at first but is a very smoochy girl once she trusts you and then she will give you head rubs & roll on her side for lots of pats. She enjoys being patted and brushed., She will let me pick her up onto my lap for a short time, and has jumped onto my lap by herself a few times . If you stroke one cat, the others come up to ask for their share. Pixie has become friends with Scotty and can be found cuddled up with him at times. Pixie would be suited to a quiet home with no young children, and needs to be kept indoors out of the sun to avoid her pink nose getting skin cancer..
Would you like to sponsor one of our foster pets? This will help us out greatly as we rely on donations to keep going. We will show your donation in the pet's listing..
Full sponsorship - $40 per month goes to help with the foster pet?s food, flea/wormer and medical expenses. Half sponsorship $20 per month. For sponsorships of 3 months or more, we will provide a Sponsorship Certificate.